Motivated by the precarious state of the world's coral reefs, there is currently a keen interest in coral transcriptomics. By identifying changes in coral gene expression that are triggered by particular environmental stressors, we can begin to characterize coral stress responses at the molecular level, which should lead to the development of more powerful diagnostic tools for evaluating the health of corals in the field. Furthermore, the identification of genetic variants that are more or less resilient in the face of particular stressors will help us to develop more reliable prognoses for particular coral populations. Toward this end, we performed deep mRNA sequencing of the cauliflower coral, Pocillopora damicornis, a geographically widespread Indo-Pacific species that exhibits a great diversity of colony forms and is able to thrive in habitats subject to a wide range of human impacts. Importantly, P. damicornis is particularly amenable to laboratory culture. We collected specimens from three geographically isolated Hawaiian populations subjected to qualitatively different levels of human impact. We isolated RNA from colony fragments ("nubbins") exposed to four environmental stressors (heat, desiccation, peroxide, and hypo-saline conditions) or control conditions. The RNA was pooled and sequenced using the 454 platform. Both the raw reads (n = 1, 116, 551) and the assembled contigs (n = 70, 786; mean length = 836 nucleotides) were deposited in a new publicly available relational database called PocilloporaBase http://www.PocilloporaBase.org. Using BLASTX, 47.2% of the contigs were found to match a sequence in the NCBI database at an E-value threshold of ≤.001; 93.6% of those contigs with matches in the NCBI database appear to be of metazoan origin and 2.3% bacterial origin, while most of the remaining 4.1% match to other eukaryotes, including algae and amoebae. P. damicornis now joins the handful of coral species for which extensive transcriptomic data are publicly available. Through PocilloporaBase http://www.PocilloporaBase.org, one can obtain assembled contigs and raw reads and query the data according to a wide assortment of attributes including taxonomic origin, PFAM motif, KEGG pathway, and GO annotation. Over the long-term, populations can respond to stressful environmental conditions via adaptive evolution. However, over the short-term, organisms under stress must alter their physiology or behavior, and doing so commonly involves changes in gene expression. Therefore, if we are to understand how organisms respond to stress, we must understand how stress alters gene expression. In recent years, a number of microarray studies have been undertaken to reconstruct the gene expression profiles of corals under stress [1–6]. However, the chip-based approaches used to date have not been able to evaluate the full scope of the stress response because only a fraction of potential transcripts have been represented on the chips. 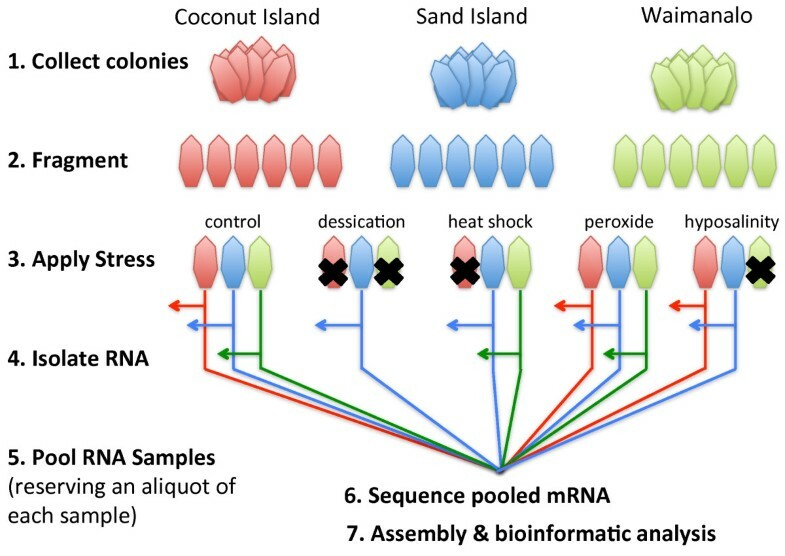 In the absence of a tiling array, whose production must await the sequencing and complete assembly of a coral genome, next-generation sequencing technologies are the only available approach for characterizing the full scope of the transcriptional response to stress. Currently, there is no complete coral genome available, and the most closely related genome that is publicly available is that of the starlet sea anemone Nematostella vectensis. In the environment, corals are exposed to a variety of natural and anthropogenic stressors. Once the stressors reach a tipping point, dramatic physiological changes can occur very abruptly, including bleaching, which involves the expulsion of all symbiotic zooxanthellae [8–15]. While the loss of symbionts may be adaptive in the short-term, once bleaching occurs, if a coral colony continues to experience stressful conditions, it will rapidly succumb--scleractinian corals cannot persist indefinitely as heterotrophs. Therefore, a critical component of coral resilience is their ability to stave off bleaching through molecular stress-response mechanisms. To date, the identification of "stress response genes" in corals and other cnidarians has been based largely on homology to functionally characterized genes in other animals (e.g., ). This approach has validity, as there is accumulating evidence that many cnidarian stress responses are likely to be largely homologous to those of triploblastic animals. However, given the long history of the Cnidaria as an independent evolutionary lineage and the many unique aspects of their biology, the cnidarian stress response repertoire is also certain to differ in key respects from that of other animals. Fortunately, the development of genomic, transcriptomic, and proteomic approaches has facilitated the de novo identification of cnidarian stress response genes. Over the last few years, a number of scleractinian transcriptomic datasets have been made available (Table 1), including EST collections produced by Sanger sequencing (e.g., Montastrea faveolata, Acropora palmata, Acropora millepora;[4, 17–19]) or "next generation" pyrosequencing (e.g., Acropora millepora, Acropora hyacinthus, Porites compressa, and Porites asteroides;). Many of these projects have focused on the effects of heat stress on the physiology of the corals and their symbiotic algae, Symbiodinium[2, 17, 19–21]. As part of this global effort to characterize the coral stress response at the level of gene expression, we have produced a reference transcriptome for the cauliflower coral, Pocillopora damicornis (Linnaeus, 1758) using adult colonies collected in Hawaii. We chose P. damicornis because of its wide distribution across the Indo-Pacific, its recognized ability to tolerate environmental stressors that prove insurmountable to many other species, and the relative ease of maintaining it in the laboratory setting. 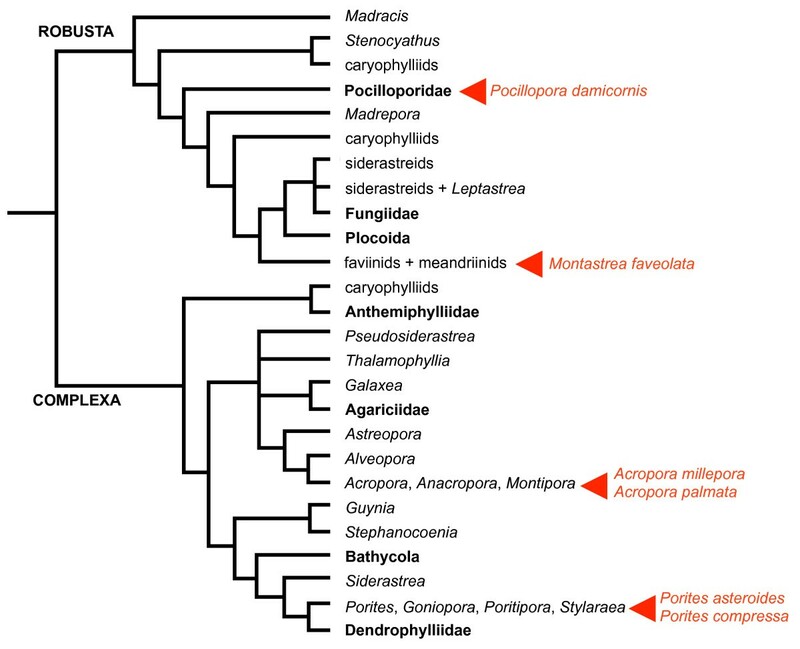 In addition, with respect to transcriptomic data, P. damicornis represents a relatively under-sampled branch of the "robust corals" clade (Figure 1) , so data from this species is phylogenetically complementary to existing data from Acropora and Porites (two genera of complex corals) and Montastrea (a distantly related robust coral). RNA was isolated from colony nubbins that had been exposed to one of four different biologically relevant stressors (heat, desiccation, peroxide, and hypo-saline conditions) in addition to unstressed, control nubbins. We sampled colonies from three geographically isolated sites that are subjected to qualitatively different degrees of anthropogenic disturbance. The raw data, as well as assembled contigs, have been placed in a publicly accessible, BLAST-searchable relational database called PocilloporaBase. Coral Phylogeny. A phylogenetic supertree of stony corals (modified from ). P. damicornis is nested within the Robusta clade. Red arrowheads indicate taxa for which extensive transcriptomic data are publicly available. PocilloporaBase is a relational database constructed in PostgreSQL (version 8.4.4). It houses the P. damicornis contigs generated in this study in addition to the results from a number of bioinformatics analyses performed on these contigs. The database structure and entity relationships are depicted in Additional File 1. The database comprises thirteen tables, eight entity tables and five relations tables. The "Contigs" table houses output from the assembly including the nucleotide sequence of each contig and other key features of the contig, including its length in nucleotides, possible start sites, the total number of reads used to build the contig, and the average sequencing coverage of each nucleotide position within the contig. Through the "Hmm" table, each contig ID (CID) is linked to 0, 1 or more protein family IDs (PFID) based on a search of Pfam (an HMM search implemented in Perl was used to compare each of the P. damicornis contigs to the conserved protein domains housed at Pfam; ftp://ftp.sanger.ac.uk/pub/databases/Pfam/Tools/OldPfamScan/pfam_scan.pl). The "Pfam" table links each PFID to the name and description of the relevant protein domain. BLASTX output is summarized in the "Blast" table. Here, each CID is associated with up to five protein sequences in NCBI that produced significant BLASTX hits to the relevant P. damicornis contig. Various metrics from the BLAST hits are linked to each protein identifier (PID) including the BLAST alignment length, the bit score, the expect score, and the number of identical amino acids. Through an "Annotation" table, the PIDs are cross-referenced with gene ontology IDs (GOID). The "Ontology" table links each GOID to the name and description of the relevant gene ontology term. The "Species" table relates each PID to the species from which the corresponding protein sequence was derived and indicates whether that species is a known symbiont of P. damicornis. The "Accession" table cross-references each PID with the corresponding mRNA ID (MID) if this information is available in NCBI. The "mRNA" table links these MIDs to the corresponding mRNA name and nucleotide sequence. Through the "Tapp" table, each PID may be cross-referenced to 0, 1, or more biochemical pathways housed in the KEGG database. The "Kegg" table associates each Kegg ID (KID) with the name and definition of the corresponding biochemical pathway. The database can be accessed via an HTML interface at http://www.PocilloporaBase.org. Users can query the database via any one of ten different search terms (described in detail in the Utility and Discussion section). Database queries are generated using the Python programming language, version 2.6.5, and the PyGreSQL DB-API module. Web pages summarizing the search results are produced as needed via Python scripts that generate HTML output. The database is hosted on a computer running Ubuntu Linux 10.04.2 using the Apache HTTP Server (version 2.2.14). Adult P. damicornis colonies were collected from three geographically isolated populations in Oahu, Hawaii (Figure 2). Coconut Island, on the northeastern corner of Oahu, is considered to be "recovering" from significant human impacts . Sand Island, off the southern coast of Oahu, just west of Honolulu, abuts a heavily industrialized area that houses the chief sewage treatment plant for all of metropolitan Honolulu . 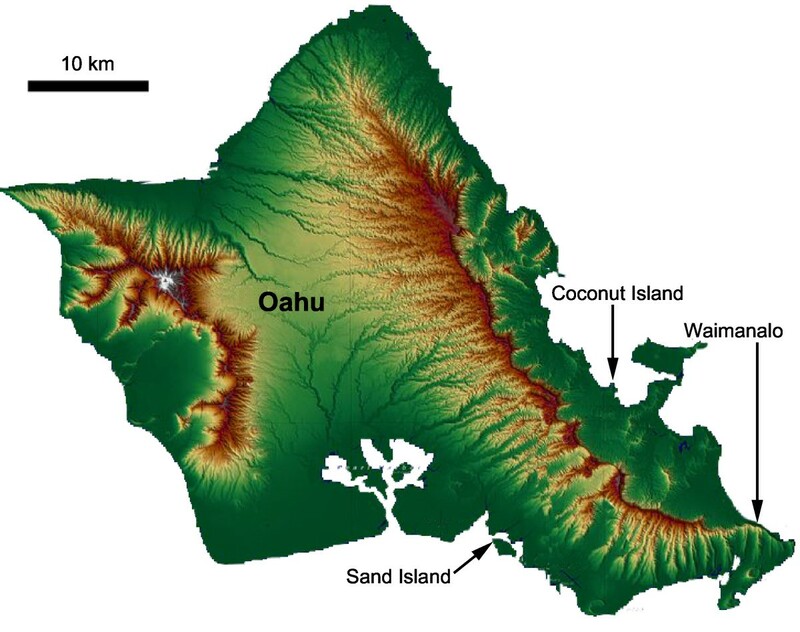 Relative to these two sites, Waimanalo, on the eastern side of Oahu is relatively un-impacted by human activity. Three to four individual colonies were collected from each site. Collection sites for adult P. damicornis. Adult P. damicornis was collected from three geographically isolated populations in Oahu, Hawaii: Coconut Island, a site found on the north eastern corner of Oahu; Sand Island, a site found on the southern part of Oahu, just west of Honolulu; and Waimanalo a site found on the eastern side of Oahu. Upon collection, each colony was fragmented into nubbins, and the nubbins were kept in an outdoor seawater table for two weeks before being subjected to a range of biologically relevant stressors administered in a controlled laboratory setting. The stressors included desiccation (four hours out of water), hypo-saline shock (two hours in fresh water), heat shock (50°C for 1 hour), and peroxide exposure (2 hours in sea water supplemented with 10% peroxide). Total RNA from stressed and control nubbins was extracted using Trizol . To produce the reference transcriptome described here, aliquots of all the individual RNA samples were pooled prior to sequencing. The pooled RNA sample was then shipped to Beckman Coulter for preparation of a non-normalized library and sequencing using the 454 sequencing technology [26, 27] (Figure 3). The remainder of each individual RNA sample is being sequenced separately on the Illumina platform so that we might identify transcriptional changes associated with particular stressors (unpublished data). Three RNA samples (one from each location) were submitted to the Ocean Genome Legacy's Ocean Genome Resource database (accession numbers: S06518, S06519, and S06520). Summary of P. damicornis transcriptome sequencing workflow. Healthy corals were collected from three different sites in Oahu, Hawaii and exposed to five environmentally relevant stressors (heat, desiccation, peroxide, and hypo-saline conditions) or control conditions. RNA was extracted from healthy populations and stressed populations and pooled together. (RNA isolated from four colony/treatments was not of sufficient quality (black x's) to be used in library preparation, so it was not subjected to further processing.) Library construction, sequencing, and assembly were performed by Agencourt Genomic Services (now Beckman Coulter Genomics); sequencing was performed on the 454 sequencing platform. After sequencing, short reads (< 40 nucleotides) and low quality reads that did not overlap with other sequencing reads were discarded, and the remaining 955, 910 sequencing reads were assembled at Beckman Coulter using MIRA3 . High quality singletons were included with the contigs in all subsequent analyses. Contig sequences were blasted against the adaptor sequences used for both the library preparation and the sequencing to insure that none of the contig sequences were contaminated with adaptors. Adaptor sequences were trimmed, and the assembled contigs were used to sequentially query the NCBI non-redundant protein database using BLASTX with an E-value cut-off of 0.001. The top five gene hits were assigned to each contig. All five of the top hits usually agreed on gene ontology and taxonomy, but where they disagreed, we associated multiple GO terms and multiple possible taxonomic affinities with a given contig. In order to identify conserved protein domains, all six open reading frames were blasted against the protein domain database at Pfam . Hits were retained only if they had an e-value cut off lower than 0.001. Using the top five hits from the BLASTX search described above, each contig was assigned a list of associated protein GI numbers. GI numbers were converted to Entrez Gene IDs using the gene2accession conversion file from NCBI. Gene2go was then used to obtain relevant GO annotation for the five top BLASTX hits to each P. damicornis contig, and the GO term(s) were then associated with their respective contig. Protein GI numbers were cross-referenced to species-specific KEGG pathways . Using KEGG's lists of annotated plants and animals, these pathways were organized into corresponding lists, and generalized KEGG pathway Ids were obtained. KEGG pathway analysis was then performed, and individual contigs were then mapped to different biochemical pathways using IPath . The top 5 hits were chosen to increase the probability of finding a hit that would allow pairing each contig with its corresponding GO category and with the existent KEGG data. Using photosynthesis as an example, the top hits matched to Symbiodinium sequences, not plants. Because Symbiodinium is not represented within the KEGG database, the contigs did not appear to represent enzymes involved in photosynthesis, when, in fact, they did. Sequencing yielded 1, 116, 551 raw reads with an average length of 379 nucleotides (range: 29-2, 025 nt; SD = 152 nt). 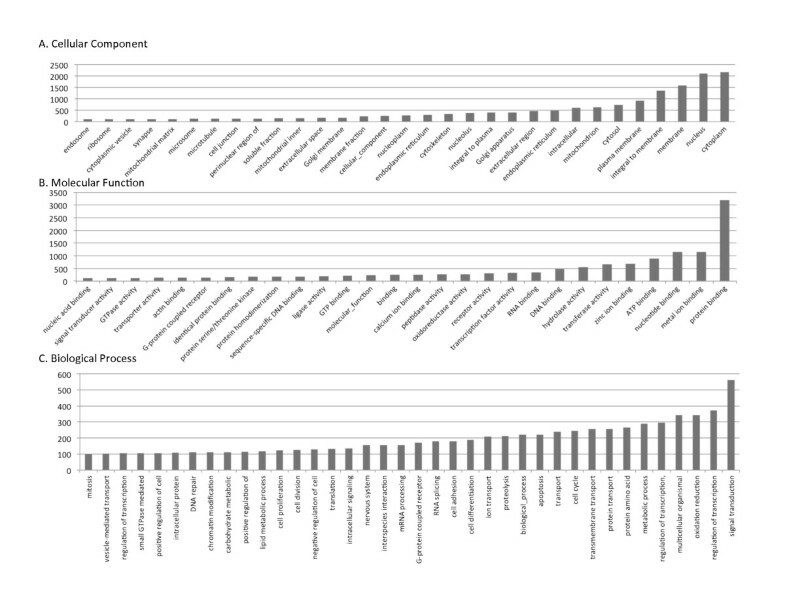 Reads less than 40 nucleotides in length and low quality reads that did not overlap with other reads were discarded. The remaining 955, 105 reads were assembled into 70, 786 contigs with an average length of 836 nt (range: 40-10, 512 nt; SD = 464 nt; Additional File 2; 3). These data are compared with other published scleractinian transcriptomic data sets in Table 1. We used the top hit in a BLASTX [PMID: 2231712] search to characterize each of the assembled contigs according to its apparent taxonomic affinity. Overall, 47.2% (or 33, 423) of the contigs matched sequences housed at NCBI with an E-value cutoff of 0.001. The other 37, 363 contigs did not match sequences at NCBI with an E-value of ≤.001 and were excluded from subsequent analyses. Of the 33, 423 hits, 31, 271 appeared metazoan, 139 fungal, 36 viral, 764 eubacterial, and 26 archaeal (Figure 4). We classified 1187 hits as "other eukaryote;" when these other eukaryotic hits were parsed further, 142 matched a sequence from Symbiodinium, the genus of unicellular algae that are intracellular endosymbionts of hermatypic corals (Table 2). For a complete breakdown of BLAST matches to other eukaryotes including dinoflagellates, see Additional Files 4, 5. Taxonomic affinities of contig sequences based on BLAST. Overall, 52.9% (or 37, 423) of the contigs matched sequences from NCBI with an E-value cutoff of 0.001. Of the 37, 423 hits, 31, 271 appeared metazoan, 139 fungal, 36 viral, 764 eubacterial, 26 archaeal, and 1187 hits as "other" eukaryote. The taxonomy of Pocillopora is currently regarded as tenuous, e.g., some 16 species have been defined on the basis of morphological features, but cladistic groupings defined by molecular sequence data are not always congruent with these morphologically defined taxa (e.g., ). We used reciprocal blast searches to investigate whether the sequences we generated in this study most closely resemble P. damicornis sequences in NCBI, rather than sequences from other closely related corals, including other Pocillopora species. We obtained 400 "P. damicornis" ESTs obtained from NCBI, and we used these to query the contigs housed at PocilloporaBase (blastn with an E-value cut-off of 0.001). Because a substantial fraction of the P. damicornis sequences currently housed at NCBI represent multiple copies of the same gene (generated in population genetics studies,) many of them matched to the same contig in PocilloporaBase. Overall, the 400 sequences from NCBI matched to 21 unique contigs at PocilloporaBase. We blasted these 21 contigs back against all nucleotide sequences at NCBI classified as scleractinian (Search "Scleractinia[Organism]"). The results are provided in Additional File 6. 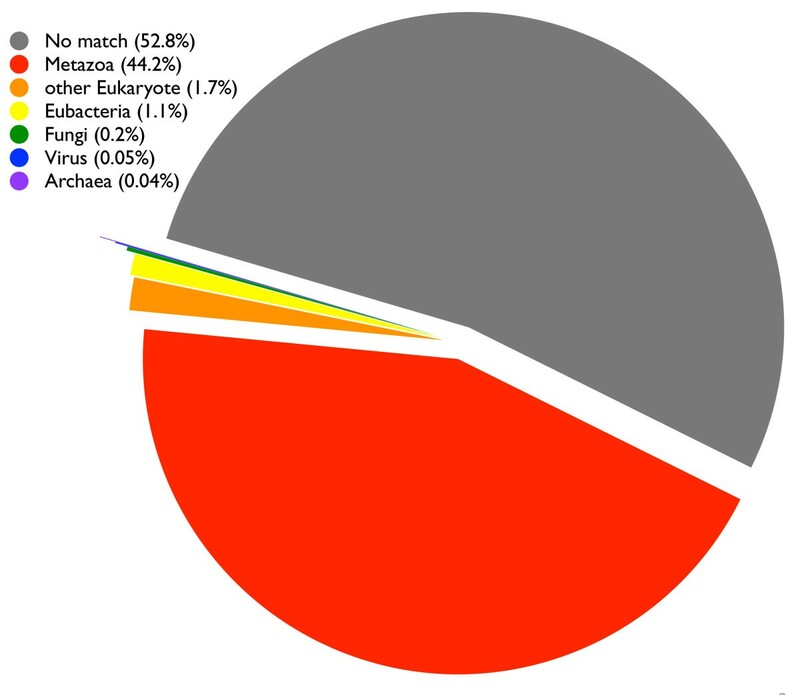 In 6 of 21 instances, the only match in the database was to a P. damicornis sequence. In 12 instances, there were matches to other corals in addition to P. damicornis, but the highest degree of sequence identity was to a sequence from P. damicornis. In one instance, a contig from PocilloporaBase exhibited equal percent identity to sequences from P. damicornis and P. meandrina. Finally, there were two contigs that exhibited a slightly higher resemblance to a sequence from a coral other than P. damicornis. On balance, these results clearly suggest that the "P. damicornis" populations sampled in this study exhibit greater sequence similarity to the P. damicornis sequences housed at NCBI than to any other coral species represented in that database. However, the taxonomic uncertainty of greatest concern pertains specifically to the genus Pocillopora. Here, the results are less decisive. Only seven of the twenty-one contig sequences we blasted against the NCBI database produced hits to sequences from P. damicornis and another Pocillopora species. In five of these seven instances, the top hit was to a P. damicornis sequence, but one contig matches better to P. molokensis and another matches equally well to P. damicornis and P. meandrina. One or more GO annotation terms could be associated with 23, 202 of the 70, 786 contigs (see Construction and content); 7, 084 contigs had a unique GO annotation. All of the GO terms that were attributed to at least 100 contigs are summarized in Figure 5 (for a complete listing, see Additional File 7). Gene ontology terms associated with P. damicornis sequences. The number of P. damicornis contigs associated with each GO term is shown for Cellular Compartment, Molecular Function, and Biological Function. Only GO terms associated with 100 or more P. damicornis sequences are shown. The contigs were subjected to the KEGG Pathway analysis, for human and plant separately . Based on this analysis, the P. damicornis sequences were mapped to metabolic pathways on the interactive tree of life . Components of most metabolic pathways were identified, including photosynthesis (KEGG id: map00195 and 00196) and lipid metabolism. However, some pathways were largely or completely absent from the P. damicornis contigs, including aminosugars metabolism (00530), lipopolysaccharide biosynthesis (00540), peptidoglycan biosynthesis (00550), glycosphingolipid biosynthesis (00602), methane metabolism (00680), androgen and estrogen metabolism (00150), and biodegradation of most xenobiotics (Additional Files 8, 9). PocilloporaBase http://www.PocilloporaBase.org was modeled after StellaBase, a genomic and transcriptomic database for the starlet sea anemone, Nematostella vectensis[33, 34]. Both species-specific databases were designed to integrate with CnidBase , a phylum-wide database meant to facilitate cross-species comparisons among cnidarians. All of the raw sequencing reads generated in this study as well as the assembled contigs can be downloaded there. At present, unlike StellaBase, PocilloporaBase houses only transcriptome data and no genomic sequence data. This repository will grow as future mRNA and genomic sequencing projects generate additional data for Pocillopora damicornis. The assembled contigs housed at PocilloporaBase can be searched using several different modalities (Figure 6). The Contig Search allows you to query sequences using NCBI Protein Accession Number (e.g. : 74000907), Nucleotide Accession Number (e.g. : 33340018), Gene/Protein Name (e.g., 'hemoglobin'), or Species Name/Taxon ID (e.g. : 'otolemur' or 45351). The option of searching the data by organism is critical, since corals can be considered a holobiont consisting of coral host, symbiotic algae (Symbiodinium), bacteria and fungi. Functionality of PocilloporaBase. PocilloporaBase houses the raw sequencing reads generated in this study as well as the assembled contigs that were generated from the sequencing reads and the output from a number of bioinformatic analyses performed on the contigs. The contigs were used to search the non-redundant database at NCBI using BLASTX. The contigs were also used to conduct an HMM search of the Pfam database to identify conserved protein motifs. 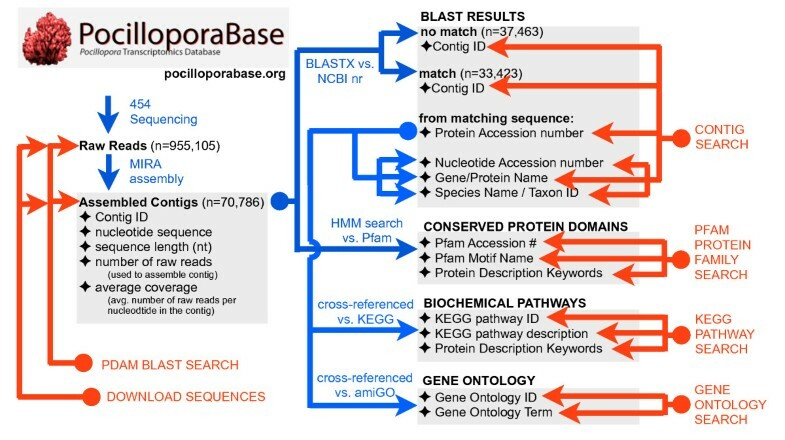 The proteins producing significant matches to P. damicornis contigs in the BLAST search were cross-referenced with biochemical pathways at KEGG and with gene ontology terms at amiGO. Users can search the Pocillopora contigs based on features of the protein they matched in the BLAST search or conserved Pfam protein domains they appear to encode. Users can also search either the contigs or the raw reads using BLAST, and all of the sequencing reads and contigs can be downloaded from the site. Steps taken to populate the database are represented by blue arrows. Actions available to the user are represented by red arrows. The Gene Ontology Search allows you to query sequences using either GO id or GO description terms . Each successful query returns a table that contains the Protein ID and Protein Name, as well as GO id, GO description, and GO type. The Protein ID links to the protein's entry at NCBI. The Protein Name links to a Protein Lookup on PocilloporaBase, which returns a list of P. damicornis contigs that generated significant BLAST hits to the protein in question. The GO id links to the corresponding gene ontology page at the amiGO database. Clicking on the GO description link performs a more specific GO lookup if any gene ontology terms are children of the parent term used to conduct the original search. If too many results are returned, searches can be restricted to one of the three principal gene ontology types: biological process, cellular component, or molecular function. If the user is more interested in the number rather than the identity of the genes in the database that map to a particular gene ontology term, the "Counts only" box can be checked. The KEGG Pathway Search allows you to query sequences using a KEGG ID number (e.g., hsa00010) or KEGG Pathway Description (e.g., Glycolysis/Gluconeogenesis). Each successful query returns a table with individual contigs identified by their Contig ID, the E-value of their match to a protein in the KEGG database, the KEGG Organism ID, homologous protein name and protein accession ID. The presence of conserved protein motifs in one or more transcripts can be investigated by searching the data for matches to the conserved protein motifs housed at Pfam. The Pfam Protein Family Classification search allows you to query sequences by Pfam Accession number (e.g., PF00006), Motif Name (e.g. : PAX, actin, DNA_methylase) or Protein Description key words. If there is a match to a conserved protein motif at Pfam, the search returns a table of Pocillopora damicornis contigs encoding that motif sorted by E-value. It is also possible to search for matches to a query sequence using the complete set of BLAST options. BLAST searches return contig id, the sequence for that contig, as well as the NCBI gene ID, gene name, and the gene sequence for any gene sequence found to match the original blast query. A gene search page allows for quick retrieval of gene and species information in the database. We used the 454 sequencing platform to generate a reference transcriptome for the cauliflower coral, P. damicornis. A taxonomic analysis of the sequence data indicates that we have captured some of the diversity of the coral holobiont, as many of the sequences appear to be derived from non-metazoan taxa including bacteria, fungi, viruses, and unicellular algae of the genus Symbiodinium. The data have been organized into a publicly available relational database that will be updated and expanded as new P. damicornis sequencing data become available. This database can be accessed using a web browser at http://www.pocilloporabase.org. The authors would like to thank Jonathan Martinez, Luc Rougee, Bob Richmond and Laetitia Hédouin for assistance with permits and animal collections, Derek Stefanik for assistance with database conception, Mark Martindale and members of the Martindale Lab of Kewalo Marine Labs for logistical support and supplies. This research was supported by a grant from the Conservation International Marine Management Area Science Program to JRF. We are grateful to three anonymous reviewers for helping us to significantly improve the clarity of the manuscript and utility of the associated database. NTK collected the animals, subjected the nubbins to stressors, isolated the RNA, and drafted the manuscript. BG, TL, JRP, SG, YX, and JAM performed bioinformatics analyses on the data, constructed the database, and built the internet interface for PocilloporaBase. LK contributed to the conception of the project and drafting of the manuscript. JRF contributed to the conception of the project, data analysis and interpretation, production of the figures, and drafting of the manuscript. All authors read and approved the final manuscript.